What an exciting week it’s been!! The Skinnytaste One and Done Cookbook came out Tuesday, if you bought the book a big THANK YOU!!! In case you don’t know, the points for all my books are in the Cookbook Tab/Cookbook Index. If you have the book you probably don’t need this meal plan, but for those of you who don’t here’s another week! Next week I may do one with recipes from the book, give me your thoughts on this! Oh, and please don’t forget to leave a review here!! I was also on Good Day NY Tuesday, you can see that here. Thank you for you meal plans! I can’t say I’ve used all the recipes suggested each week but, due to differing preferences but I do enjoy them. Your Maple Soy Glazed Salmon was a hit! I also enjoyed the Minestrone Soup! Thanks again for all your hard work! Please keep posting these meal plans! They help me so much!! Hi Gina, I was just wondering how long the minestrone soup would last for in the refrigerator for meal prep and if the zucchini would get soggy? Thanks for everything! This is my third week using your meal plans and I love them!! They are a lifesaver for busy, working parents. Thank you! Love the meal plans and just bought your new book. I would love if you incorporate some recipes from the new book into your meal plans. 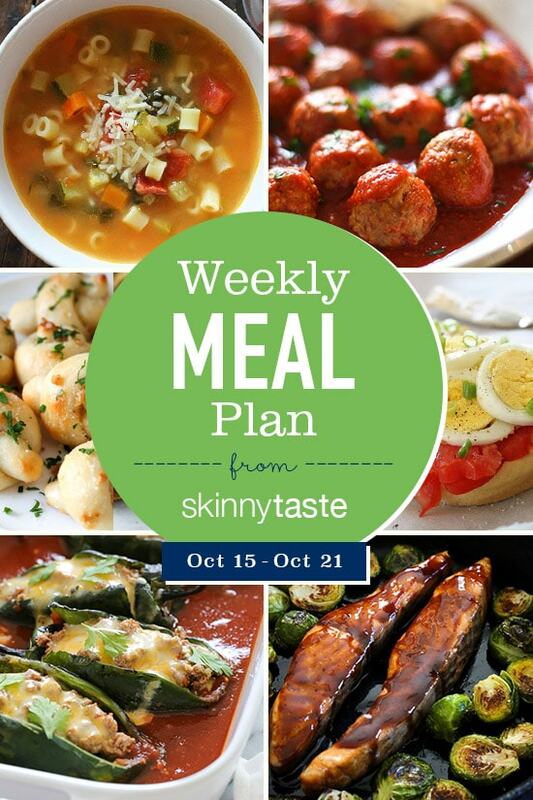 Thank you for sharing these – I love your meal plans, they make sticking to a meal plan easy and delicious! HI! I’m new here and just discovered your meal plans. What a wonderful resource for people who are new to this thing or who are stuck in a rut with their meal planning and weight loss. Like me! I can’t wait to start using these! Thank you! Thank you! I just found your website and the meals are amazing. 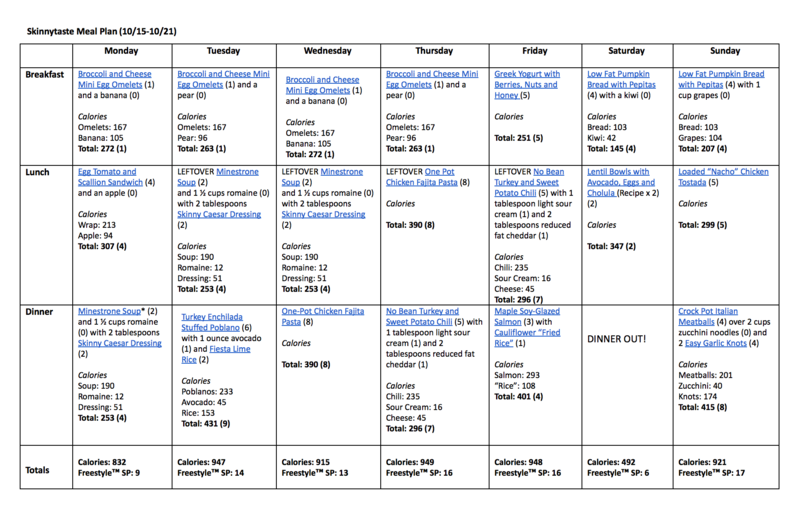 Please keep posting the meal plans, they are so helpful for people like myself who struggle with planning. I am looking forward to your book. thank you for doing this!!!! yes, please continue posting these. Another winning week. Question: I can’t seem to find what the frozen peas and carrots are for? This is awesome! So excited to start using your meal plans! I’ve been looking for something like this for some time now! Would love a whole meal plan with cookbook recipes! I own all three books now and use skinnytaste exclusively for my family of five. Love your content, and congrats on your new book! Excellent recipes – thank you. I especially like that the recipes show the Weightwatchers points. Would be great to have some meal plans that are from your books. You could start with a Fall Plan from one or more of your books. It would be in addition to your weekly free for website. Having seasonal plans are good enough for me. Don’t really need a plan for an exact week. An entertaining plan might be fun too. Love your style of cooking. Yes! I love these plans. I look at them every week!!! Thank you for doing it.